Historically “challenge coins” have their origin in the military services. As early as the time of the Roman Empire coins were presented to soldiers much in the same way medals are today. An example of one such coin bears the head of Roman Emperor Julian (361 BC – 3AD). One side of the coin depicts the Emperor wearing a royal crown or diadem and the reverse side a centurion holding a shield or standard in one hand and restraining a kneeling subject with the other. The words on the coin, “Virtus Exercitus Romanorium” mean “Valor of the Roman Army”. There are several legends as to the first inception and use of the challenge coin. Tradition records that these coins were first given to boost morale as rewards for exceptional teamwork and in recognition of achievement. Coins were eventually exchanged with members of other groups to acknowledge support and unity of purpose and mission. At any time and in any place these early “watchmen” and modern day “warriors” came together and a challenge, known as “coining”, was often initiated. An officer drawing their coin in an obvious display of pride signaled others to respond and display their coin. Being found not in possession of a coin required buying a round of drinks. Rules also included a call to inspection as a prohibition against defacing a coin. Today challenge coins depict mottos, verses, symbols and represent a tangible source of pride, respect, and camaraderie in support of all opportunities realized together. If you carry or possess a challenge coin you do so with the obligation to those ideals of the depicted organization. The CPA-USA challenge coin also embraces a rich history and deeply held values that express a spirit of honor, duty, nobility and leadership to be shared by all. 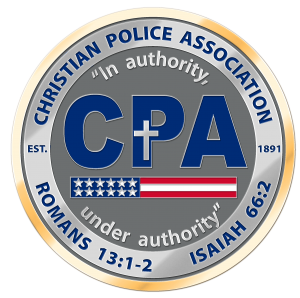 On one side of the coin is the CPA-USA logo. It includes the original date the CPA was initially established in the United States. There are two scripture verses. Romans 13:1 reminds us that all authority is ordained by God, not as experiments but, so that within limits we can learn and sustain peaceful societies. Isaiah 66:2 is a verse that speaks to the profound reverence and discipline of the most sacred principles and disciplines of prayer, God’s Word and fellowship. Each contradicts conventional wisdom yet is required for the relationship God offers to those who seek Him. In humility we are to bear a deep sense of the worthiness towards God in worship and fellowship with others. It is a call to be contrite and broken in prayer and repentance over the things the eye has seen. And with complete dependence upon Him take God’s Holy Word seriously and make application into our lives. On the other side of the coin is an eagle clutching the keys of justice in one talon and pardon papers in the other. Four stars arched above the eagle’s head are representative of being in authority yet under authority. 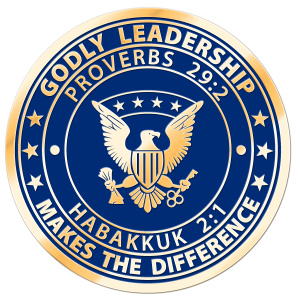 There are two scripture verses as well: Proverbs 29:2, recognizing that when authority does not have a foundation in God it has an adverse effect on all of society and Habakkuk 2:1, a clear mandate to look around our sphere of influence as well as within ourselves and be prepared in mind, body and spirit to respond to how the eyes have affected the heart. The motto that speaks to the authority we hold is, “Godly Leadership Makes the Difference”.